Environmental Science 10 Edition Designed For The Undergraduate, Introductory Environmental Science Course, The Thoroughly Updated And Redesigned Tenth Edition Of Environmental Science Continues To Present A Comprehensive, Student-Friendly Introduction To Contemporary Environmental Issues With An Emphasis On Sustainable Solutions That Meet Social, Economic, And Environmental Goals. This Acclaimed Book Is The Only Text That Explores The Underlying Causes Of Environmental Problems And Root-Level Solutions And Presents Both Sides Of Many Critical Issues. Thought-Provoking Features Throughout, Including Critical Thinking Exercises, Key Concept And Spotlight On Sustainability Boxes, Go Green Tips, And Point/Counterpoint Debates, Along With The Updated Statistics And Data Of Key Issues, Encourage Readers To Become Much Deeper And More Critical Thinkers.Current And Highly Relevant, The Tenth Edition Discusses The Challenges Of The Growing Human Population And Resource Depletion And Solutions That Address These Issues In A Sustainable Manner. The Book Also Discusses Nonrenewable And Renewable Energy Options And Their Pros And Cons, And Provides Expanded Coverage Of Local, Regional, National, And Global Environmental Issues And Sustainable Solutions. This Comprehensive Text Includes Updated Coverage Of Environmental Economics, Ecology, And The Application Of Science And Technology To Environmental Concerns. 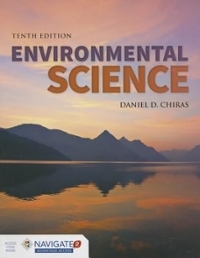 With A Strong Focus On Sustainability And Critical Thinking, A Topic The Author Introduced To The Environmental Science Market, Environmental Science, Tenth Edition Is An Essential Resource For Students To Understand The Impact They Have On The Environment And Ways That They Can Help Solve Them.Each New Print Copy Includes Navigate 2 Advantage Access That Unlocks A Comprehensive And Interactive Ebook, Student Practice Activities And Assessments, A Full Suite Of Instructor Resources, And Learning Analytics Reporting Tools.